29-32 1s cross by the right and set. Baileys was the first 44% liqueur to use cream and alcohol together in a manner sufficiently stable to allow commercial distribution. 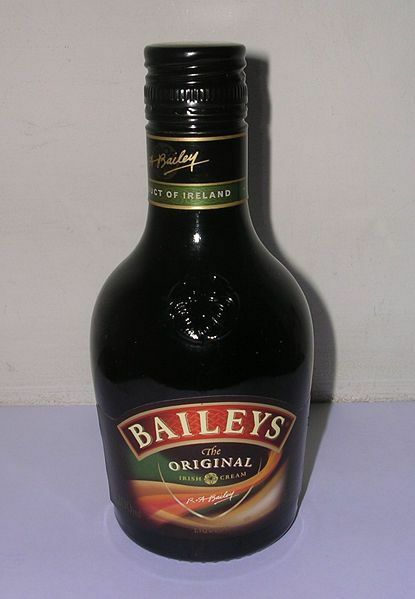 The alcohol in Baileys is produced from a bacterial fermentation of whey. The cream and alcohol, together with some whiskey are homogenized to form an emulsion, with the aid of an emulsifier containing refined vegetable oil. This process prevents separation of the whiskey and cream during storage. The quantity of other ingredients is not known but they include chocolate, vanilla, caramel and sugar. Text from this original Baileys Irish Cream article on Wikipedia.